For over a decade, the name to beat in the hybrid segment has continuously been the Toyota Prius. And now, with the introduction of the new 2017 Toyota Prius Prime, it just got a whole lot harder to beat the famous hatchback. Drivers looking to save on gas will find that this eco-friendly vehicle goes above and beyond the call of duty in terms of savings and performance. With the Prius finally reaching its “Prime”, you can expect the best of just about everything in the new 2017 Toyota Prius Prime in Janesville, WI. When you opt for this eco-friendly model, you get incredible performance out of this plug-in hybrid. Not only does it offer the highest estimated MPGe rating of any plug-in hybrid, but it features easy handling and maneuverability. If you’re interested in seeing the Prius models currently in our inventory, feel free to click the button below. Otherwise, check out the comprehensive chart we’ve compiled below to learn more about the new Prius Prime. After the Prius’s all-new redesign for 2016 and its amazing new slew of technology, it’s hard to imagine that the 2017 model will be able to improve upon its predecessor, but then again, that’s exactly what’s happening. In the new 2017 Toyota Prius Prime in Janesville, WI, you can expect even more premium features and exclusive technology. Some of the more notable new features include a 11.6-inch, HD central multimedia screen with standard navigation and available full color head-up display. Of course, safety has always been a top priority for Toyota, as evidenced by the “Prime” version of the 2017 Toyota Prius, which will be available with a long list of advanced safety technology including the new Toyota Safety Sense P system, which bundles active safety features like the Toyota Pre-Collision System, Pedestrian Detection, Automatic Braking Lane Departure Alert with Steering Assist, Dynamic Radar Cruise Control and more. 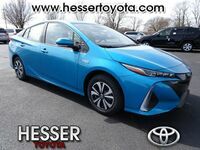 If you’re interested in getting behind the wheel of the 2017 Toyota Prius Prime when it arrives on our lot here at Hesser Toyota, be sure to contact us here on our site or give us a call. From there, we’ll be sure to notify you as soon as the new Prius joins our stock. That way, you can be the first person in Janesville to take it out for a test drive. Never one to disappoint, we’re sure that the 2017 Toyota Prius Prime will live up to our expectations and then some!